What’s for Dinner When the World Ends? When the world is running down, how will you fend for yourself? Will you starve to death or will your years of preparation finally pay off? 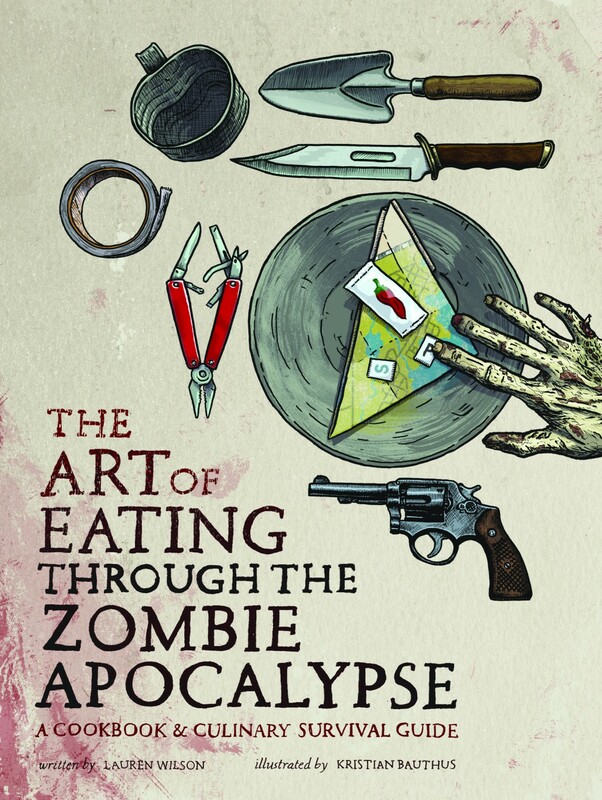 The Art of Eating Through the Zombie Apocalypse offers not only easy-to-follow food-preparation recipes to attempt at the end of the world (as well as anytime, really), but it’s also a common-sense field guide to surviving on your own, whether there’s an undead uprising or not. Written by Lauren Wilson and illustrated by Kristian Bauthus, this book begins with 50 pages of life hacks and cleanliness tips that will put both Boy Scouts and Girl Scouts to shame. Once you’ve perfected the art of self-sustaining survival tips, scavenging supplies, tracking, hunting and trapping, the book ventures into specific topics, like creating bug-out bags, as well as water, fire and food prep that can be used every day. The fun graphics and illustrations of the book make it feel less like a textbook and more like a choose-your-own-adventure novel. Unlike The Zombie Survival Guide by Max Brooks, The Art of Eating Through the Zombie Apocalypse also includes a low-tech food preparation guide, which features quick-and-simple recipes, calorie-rich selections and comfort food to prepare during the early undead days. Later chapters include surviving on the natural resources of Mother Nature, rationing out MRE meals or living the life aquatic. When I first heard about this book, I wrongly assumed it would only contain recipes that may or may not be feasible to prepare during an emergency situation. How wrong I was. Reading it, I discovered many tips that can actually assist every-day life (no Zombie Apocalypse needed). Also, there’s a fair amount of science in this sci-fi book that’s easy to understand by the layman. Additionally, source material of various topics are cited for more detailed information (including a few inaccuracies of hunting found on AMC’s The Walking Dead, which was enjoyable). Gardening — like survival — is an art and there’s basic ingredients for both. Whether you plan to bug out to a secondary location or intend to ride out the undead uprising at home, there’s no need to feast on brains with the proper direction of this book. Learn how to build a rocket stove or a root cellar, raise mealworms or, most importantly, a DIY kit to brewing alcoholic beverages. It’s all here! Whether you’re eating out of your fridge (or your cupboard); urban hunting, foraging, growing plants incognito, learning about food preservation or eating on the run, you will definitely be better prepared to survive on more than just eating Twinkies or Spam. In fact, there’s an adjusted food pyramid and some themed recipes I can’t wait to try — with or without the end of the world — including: Overnight of the Living Dead French Toast, The Wok-ing Dead Stir-Fry, Dawn of the Bread Salad and The End of Ra-Man. Regardless if you’re bugging in and avoiding the fast Zombies or bugging out and avoiding the slow ones, Lauren Wilson and Kristian Bauthus craft a great book that includes a lot of information cram-packed into this 328-page book. Not only does Ms. Wilson’s experience as a professional chef shine throughout this book, but her geek cred is firmly intact, as well, with each of her pop-culture references used to perfection. Mr. Bauthus makes each illustration engrossing and engaging, which helps make multiple reads of this book a pleasant experience. Don’t attempt to live off the grid without this book! WTF Moment: Ms. Wilson’s infectious sense of humor mentions possibly using this book to begin emergency food prep during the Zombie Apocalypse!